Sliding Door Replacement Vs Repair – Which is the Best Option? Here are some things to keep in mind about your aluminium and glass sliding door when deciding on replacement versus repair. Older doors are superior to newer doors because the Aluminium used in older doors is of a much higher quality when milled and extruded than the more modern doors. This is obvious when cutting the Aluminium Door. The steel used in the fasteners which hold the door frames together is of a far higher quality in the older doors than in, the newer doors, making the older doors stronger and more robust than the more modern doors. Click play on the video below as we explain what you need to consider for either a repair or replacement for your sliding door. It is much more cost effective to repair rather than replace. Repairs costs are in the hundreds while replacements cost is in the thousands. Unfortunately, and generally speaking the newer the sliding door, the poorer the quality, like many things these days. So our verdict is that it is better to repair rather than replace your sliding doors. If you choose to repair, then it is important for you to feel confident in knowing that the repair is done to a high standard. This will allow you ease of operation and there won’t be any problems with the work in the years ahead. Adsafe Doors guarantee to repair your sliding door to that high standard, enabling you to have the confidence in knowing your repair has been done by a professional. So if your sliding door noisy and difficult to move or if you are having trouble locking it or maybe it just keeps coming off the runner then we can repair it. We have the materials and tradesmen ready to repair and transform your sliding door. We have hundreds of satisfied customers all over Sydney. The continued use of a sliding door with worn rollers always results in excessive wear and damage to the relatively soft Aluminium track runner. If left unchecked, this damage will cause premature wear to any new rollers that may be installed. So in the circumstances like this, we always recommend repairing the track. We do this by first machining the track and then fitting a replacement cover track neatly over the top, which is smooth and which fits the roller precisely. 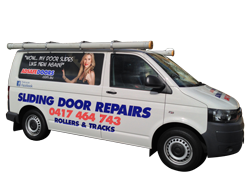 Our advice is to have your sliding door serviced by a competent and licensed tradesperson only. When it gets noisy or difficult to move, you have to make enquiries about fixing your door. You don’t want what could be minor damage becoming a major expense. In aluminium and glass sliding door repairs, Adsafe Doors can bring a level of professional repair, quality of workmanship and Guarantee that your door will slide better than new. So after arriving on-time for our agreed booking and identifying the brand of sliding door that you have, we supply you with a clear cost of door repair. The security/fly screen is removed and then if need be the fixed panel is removed. Next, we remove the door and place it on its edge and examine the bottom rail and the carriages and rollers. We remove the bottom rail from the glass panel if required so as to remove and replace the Sliding door rollers which are housed in the rail. We can dismantle any part of the door frame around the glass if there are any issues with the rubber seals and then refit the frame. We show you the carriages and rollers of your aluminium and glass sliding door and then show you our replacement rollers, which are far better in most cases and have a five-year manufacturer’s warranty. We then install the new door rollers into the rail. To get a good result we machine the track (runner), leaving a “stump”, this is very important because the new track has to precisely fit this ‘stump’ of the old track and the concave roller. Next, we fit the new replacement track. After the Sliding Door and fixed panel are back in place, we adjust the height of the rollers in the door so that the door slides and locks correctly. When you have tried and tested the door and are satisfied with the operation of the sliding door, we clean up. Please have a look at the video below. It shows a typical repair process for a popular brand of aluminium and glass sliding door in Sydney. In this video, we are working on a Clearview Aluminium Sliding Door. The whole procedure from arrival to completion and testing is shown. But we also repair Bradnam’s, Trend, Wunderlich, Clearview, Comalco and Airlite sliding doors. The door is stuck and will not move. The carriages and rollers have collapsed completely causing the track to become badly scored and worn. So after we installed the new rollers and fitted the new track, the door slid better than new. We got an excellent result with this door; the door finished up sliding and locking perfectly. The video shows a repair that is the most common type of Sliding Door Repair problem found in Sydney. Give our team a call today and we’ll provide a quote for you on the phone. We look forward to hearing from you.